Alright guys, today I'll be introducing a new brand, a new idea, a new look. I was recently contacted by the company "D’or et d’argent". I was immediately blown away by their distinct style, and what this clothing brand represents. It is a project that is focused on creative minds, encouraging people with ambition and drive to start acting on their dreams. They encourage people to start new projects, be involved in collaborations in order to see and make changes. This is a lifestyle brand aimed and dedicated to the upcoming generation of ambitious and focused entrepreneurs around the world. "D’or et d’argent" is their first collection which uses photo mixed graphics as their key handwriting. It is a mixture of luxury and digitally printed pieces that is being used to represent their vision of the world. They combine elements from the city and from nature. "D’or et d’argent" will soon be complimented with a full collection, where more clothing and accessories like hats, bags, shoes, coats, jeans, and sweaters will be available. "More than a clothing brand, our aim is to become a real platform to represent and encourage ambitious and creative people who are not scared to believe in their dreams and start projects in order to make those dreams come true. We have newsletters and a platform to feature these creative leaders around the world." - "D'or et d'argent"
I love this, because it is a direct representation of what the blogging community is about. We as bloggers, as entrepeneurs, online shops, journalists have all built up the courage to share snippets of ourselves on the internet, to put our ideas out there. Whether that be inspiring others through personal style, creating items from ideas, or using our talents to share to the world...we have taken the step to put action into our words, where words stemmed from our ideas. To put pieces of ourselves for everyone to see and pick apart, is intimidating. But we have all chosen to be part of action, of self motivation; self drive. So take a look at this clothing brand and dig into what they represent and the unique styles that stem from it; make changes, conquer fears, be inspired. 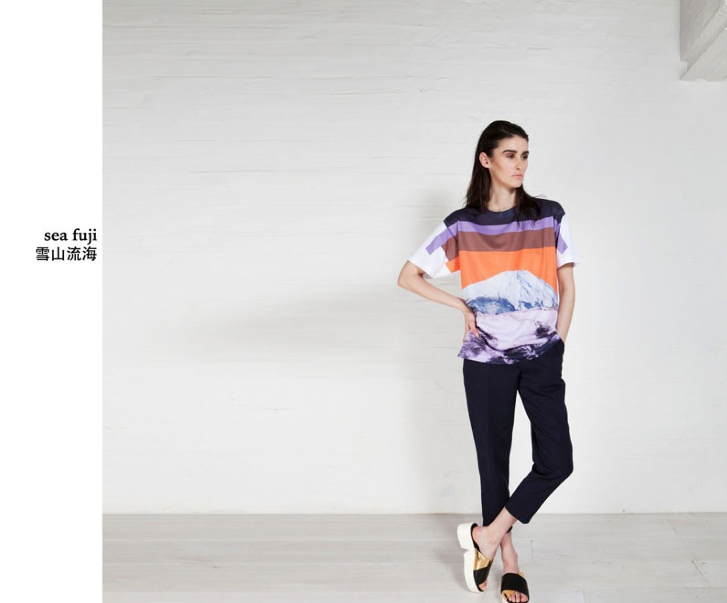 My favorite piece from their collection is the "Sea Fuji" shirt shown below. I lived in Japan for some time growing up, and Fuji holds a lot of great memories. You can shop their store and receive 30% off your purchase by using code "DD30BLOGOFFX " at checkout! BUY "SEA FUJI" HERE. Sounds like a great collaboration - thank you for sharing a new brand. I'll definitely be taking a look.